Why in the world would you want to compost in the first place? Do you even know what compost is? What do you do with the stuff when you've made it? What are the nutritive qualities of compost for your plants or vegetables? One of the best ways to jump into composting is to understand the value of finished compost. This part of our website will briefly address the above questions. Your choice to compost has incredible benefits for you, your yard, home, and the earth. Imagine this: the waste stream out of your home can lessen by as much as 35% just by composting kitchen and yard waste! There are many benefits to starting your own compost pile, whether your end goal is a more productive garden, to recycle lawn and kitchen waste or just a green, lush lawn. Compost provides benefits to soil it's used in, improving moisture absorption and drainage. This is especially true if your soil is of poor quality. That means that by using compost in your garden, you can grow more plants in soils they wouldn't ordinarily be suited for. While compost isn't a particularly effective fertilizer on its own, the reduction in runoff that results from its use makes existing fertilizers (both natural and chemical) a lot more effective. Fertilizer contamination of water is also significantly reduced. The environmental benefits of using compost are significant. Making use of this material can help clean up contaminated soil, reducing runoff of toxic materials and binding some toxins. Compost can help reduce erosion on lake, stream, and river banks, as well as along roads. 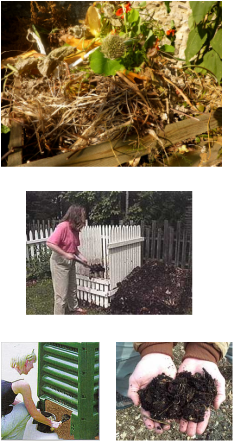 Composting also makes use of materials that would otherwise be waste, including food scraps, yard clippings, small animal bedding and much more. Less garbage means lower garbage bills. That's a good deal if you're paying for that extra refuse bin to throw compostable organic material away at the street. Understand the regulations of your local waste management district to determine if you are allowed to compost at home. Fewer costly dump-runs. If you are periodically running to the dump with a load of yard waste that could more easily be composted, well, rethink your strategy and save some money. Lessens the burden on landfills. Now this is a BIG issue these days. Numerous municipalities are trying hard to educate the public about how to compost and recycle effectively so that landfills do not become mere dumping grounds for laziness, ignorance, or over-consumption. Free soil additive and natural fertilizer. Well-made compost is naturally balanced with nitrogen, phosphorous and potassium (N-P-K), and is nutrient-rich with a host of beneficial microorganisms. This means you are "growing the soil" without artificial inputs such as synthetic fertilizers that are often too high in nitrogen. A healthy organic soil makes for more nutritional vegetables. So, stop buying those expensive synthetic fertilizers that destroy your soil and wind-up in the wastestream through run-off! Lowers water bills when used as a soil mulch. Seasonal additions of compost (for example, Spring and Fall) protects exposed soils from drying out. The soil retains moisture beneath top-dressings of compost and this means less watering! "Composting gives you the chance to look as if you know what you're doing even if you don't. That's okay, the little bacterial critters in your compost bin will cover for you!" For More Info- Do It Yourself Compost Info click here! Compost returns nutrients to the soil such as phosphorus, potassium, nitrogen, and many trace minerals, all to be released slowly over 1-2 years for optimal plant growth & health. Compost is a natural fertilizer that improves soil aeration, tilth & drainage. Compost, as a top-dressing, promotes weed control by suppressing growth. Furthermore, improved tilth makes it more difficult for weeds to anchor roots. Compost controls erosion by creating good tilth. Compost protects plant roots from sun and wind damage. Compost conserves water, when used as a mulch: the soil retains moisture beneath it. Compost increases water retention when absorbed into loose or sandy soils. It aids drainage in clay or other heavy soils. Compost reduces soil diseases because of its high nutrient content.